The Bulgarian Health Minister Anna-Maria Borisova has announced that 430 hospitals are not enough for 7,5 million people. “This is absurd. Around the world this would be unthinkable,” Borisova said Monday at a meeting with local doctors from the Bulgarian city of Kardzhali. 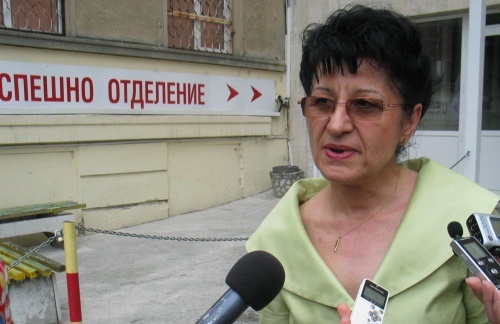 According to the minister, the chronic disease of the Bulgarian health system was the over hospitalization. “From 1,2 million in 2001, hospitalizations have reached 1,85 million in 2009. This means that every fourth Bulgarian is hospitalized at least once a week,” Borisova said. In her words, there are clinical pathways through which the health insurance fund is draining money all the time for “dizziness, renal colics, diabetic polyneuropathy”. “The results from the clinical pathways is spending money and having no efficiency. In Europe, it is the contrary,” the minister said. Borisova announced the first step of the reform in the Bulgarian health system. It would be the redirection of some of the beds for active treatment to additional treatment for patients with clear diagnosis which require supportive treatment, like diabetes, or rehabilitation, like orthopedic cases. She added that some of the clinical pathways will be directed out of the hospitals. “14% of the doctors in the hospitals are pensioners, 15% have never specialized, and the number of anesthesiologists and pathologists in the country is under the critical minimum,” Borisova said. She also noted that neurology hospitals will not be closed due to the increasing number of insults, while municipality hospitals will have available surgeries and obstetric and gynecologies only wherever they meet the required standards.